The reaction product obtained by cohydrolysis and condensation of (A) a fluorinated alkyl-bearing alkoxysilane, (B) an amino-bearing alkoxysilane, and (C) an alkoxysilyl-bearing polyorganosiloxane is dissolved in water to provide a water-soluble, water/oil repellent treating composition. This water/oil repellent treating composition has improved water solubility and shelf stability, has no detrimental effects on the environment because of the aqueous system, and imparts fully durable water repellency and satisfactory softness and hand to textiles. This invention relates to a water-soluble, water/oil repellent treating composition which is used to treat substrates, especially fibrous items such as clothes, non-woven fabrics, rainwear, carpets, sofas, leather and paper, to impart all of water/oil repellency, stain proofing and softness thereto, and a method for preparing the same. More particularly, it relates to such a water-soluble, water/oil repellent treating composition with which substrates can be treated in a simple manner without detrimental influence on the environment. X is at least one linking group selected from among —CH2—, —CH2O—, —NR3—, —CO2—, —CONR3—, —S—, —SO3— and —SO2NR3—, R1 is an alkyl group having 1 to 4 carbon atoms, R2 is an alkyl group having 1 to 4 carbon atoms, R3 is hydrogen or an alkyl group having 1 to 8 carbon atoms, “a” is an integer of 0 to 3, “b” is an integer of 1 to 3, “c” is 0 or 1, n is an integer of 1 to 20, and m is an integer of at least 1. Herein R3 and R4 each are independently hydrogen, an alkyl group having 1 to 15 carbon atoms, or an aminoalkyl group having 1 to 15 carbon atoms, R5 is a divalent hydrocarbon group having 1 to 18 carbon atoms, R6 is an alkyl group having 1 to 4 carbon atoms, R7 is an alkyl group having 1 to 4 carbon atoms, and “d” is 0 or 1. Herein R8 to R10 each are an alkyl group having 1 to 6 carbon atoms, R11 is an oxygen atom or an alkylene group having 1 to 4 carbon atoms, and “e” is 0 to 50.
wherein m is an integer of at least 1, preferably 1 to 20. X is at least one linking group selected from among —CH2—, —CH2O—, —NR3—, —CO2—, —CONR3—, —S—, —SO3— and —SO2NR3—, wherein R3 is hydrogen or an alkyl group having 1 to 8 carbon atoms. R1 is an alkyl group having 1 to 4 carbon atoms, R2 is an alkyl group having 1 to 4 carbon atoms, the subscript “a” is an integer of 0 to 3, “b” is an integer of 1 to 3, and “c” is 0 or 1. Illustrative, non-limiting, examples of the silane of formula (1) are given below. Herein R8 to R10 each are an alkyl group having 1 to 6 carbon atoms, R11 is an oxygen atom or an alkylene group having 1 to 4 carbon atoms, and “e” is 0 to 50, preferably 5 to 20. Illustrative, non-limiting, examples of the polyorganosiloxane of formula (3) are given below. Herein R3 and R4 each are hydrogen, an alkyl group having 1 to 15 carbon atoms, especially 1 to 4 carbon atoms, or an aminoalkyl group having 1 to 15 carbon atoms, especially 1 to 4 carbon atoms, R3 and R4 may be the same or different; R5 is a divalent hydrocarbon group having 1 to 18 carbon atoms; R6 is an alkyl group having 1 to 4 carbon atoms; R7 is an alkyl group having 1 to 4 carbon atoms; and “d” is 0 or 1. 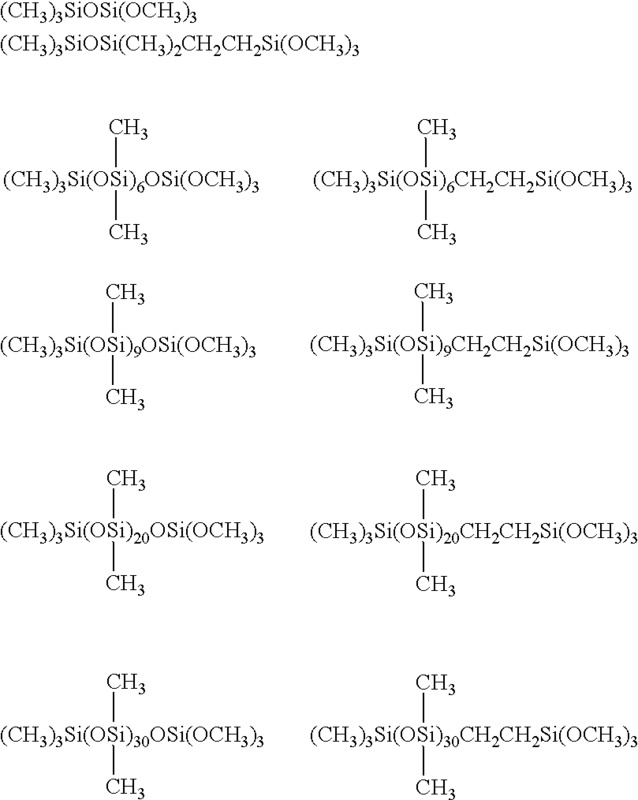 Illustrative, non-limiting, examples of the amino-bearing alkoxysilane of formula (2) are given below. Of the above-illustrated compounds, H2N(CH2)3Si(OCH3)3 H2N(CH2)3SiCH3(OCH3)2 and H2N(CH2)2NH(CH2)3Si(OCH3)3 are most preferred. The molar amount of water added for cohydrolysis of components (A) and (C) is 1 to 3 times, especially 1.25 to 2.5 times the molar amount of components (A) and (C) combined. If the molar amount of water is less than the molar amount of components (A) and (C) combined, more alkoxy groups may be left. If the molar amount of water is more than 3 times, condensation may take place to an excessive extent. Preferred reaction conditions for cohydrolysis of components (A) and (C) include a temperature of about 10 to 100° C., preferably about 60 to 90° C. and a time of about 1 to 3 hours. Preferred reaction conditions for condensation of component (B) include a temperature of about 60 to 100° C. and a time of about 1 to 3 hours. To the water-soluble, water/oil repellent treating composition, an amino-modified silicone emulsion or an epoxy-modified silicone emulsion or both may be added for the purpose of imparting softness and improving hand. While it is known to apply an amino- or epoxy-modified silicone emulsion to fibers for softness and hand improvements, the addition of such an emulsion to the water-soluble, water/oil repellent treating composition of the invention can also achieve softness and hand improvements. An appropriate amount of the amino- or epoxy-modified silicone emulsion is 0 to 200 parts, especially 50 to 100 parts by weight per 100 parts by weight of the reaction product of components (A), (B) and (C). More than 200 parts of the amino- or epoxy-modified silicone emulsion is undesirable because such a large amount improves softness, but adversely affects water/oil repellency. The water-soluble, water/oil repellent treating composition thus obtained can impart satisfactory water/oil repellency and softness to items of natural or synthetic fibers, textiles, lather and paper through a simple process, for example, by applying the composition to the item in a conventional manner as by dipping or spray coating, followed by drying. The composition is especially effective to apply to fibrous items although it is also applicable to other substrates such as glass, metals and plastics. According to the spray method of JIS L 1092 (1986), water was sprayed to the surface of the treated sample. Water repellency was rated from the surface state. Additionally, each of the treating solutions was sprayed to a piece of polyester fiber taffeta, and dried by heating at 100° C. for 2 minutes and at 150° C. for a further 2 minutes. The thus treated fabric was examined for durability of water repellency by the following test. The results are shown in Table 5. The treated fabric was placed in a wash bath containing 5 g of sodium alkylbenzenesulfonate and 2 g of sodium carbonate per liter of water. A household washing machine was operated at a bath ratio of 1:100, the fabric was washed for 15 minutes at a water temperature of 50° C. The spray type water repellent test was carried out on the washed fabric. Japanese Patent Application No. 2000-390204 is incorporated herein by reference. wherein R8 to R10 each are an alkyl group having 1 to 6 carbon atoms, R11 is an oxygen atom or an alkylene group having 1 to 4 carbon atoms, and “e” is 0 to 50, the reaction product being dissolved in water. 2. The composition of claim 1, further comprising an amino-modified silicone emulsion or an epoxy-modified silicone emulsion or both. 3. A method for treating a fibrous item to impart water and oil repellency, comprising treating said fibrous item with the composition of claim 1.
effecting condensation reaction of the (partial) cohydrolysate with component (B) to form the cohydrolytic condensation reaction product of claim 1. WO1995023830A1 (en) 1994-03-04 1995-09-08 E.I. Du Pont De Nemours And Company Amino and fluoro group containing siloxanes, ... etc.